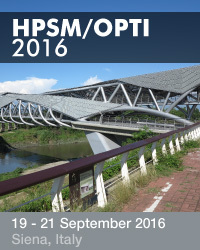 Los días 19, 20 y 21 de septiembre de 2016 se celebra en Siena (Italia) uno de los congresos más importantes sobre optimización de estructuras: “The 2016 International Conference on High Performance and Optimum Design of Structures and Materials HPSM/OPTI 2016“. Participo en dicho congreso tanto en su Comité Científico como la aportación de tres comunicaciones. 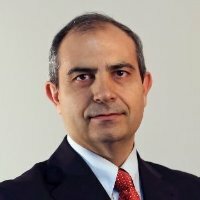 A continuación os paso los resúmenes de dichas comunicaciones. MARTÍ, J.V. ; ALCALÁ, J.; GARCÍA-SEGURA, T.; YEPES, V. (2016). Heuristic design of precast-prestressed concrete U-beam and post-tensioned cast-in-place concrete slab road bridges. Abstract: This paper proposes simulated annealing and threshold accepting procedures for the automatic design of two different bridge types. Both cases are prestressed concrete road bridge decks typically used in public road construction. Simulated annealing is first applied to a precast beam of 30-30 meters of longitudinal spans and 12.00 m of width. The beam has a double U-shape cross-section and a beam spacing of 6 m. This problem involves 59 discrete design variables for the geometry of the beam and the slab, concrete grade, reinforcing steel and prestressing steel. The simulated annealing method indicates savings of about 5% with respect to a traditional design. The second bridge case is a 20-36-20 m post-tensioned cast-in-place concrete slab road bridge deck. This example needs 33 discrete variables to define the complete structure. The threshold accepting method is used for the optimization. Our findings indicate savings of about 7.5% with respect to the design based on experience. Finally, the results show that heuristic optimization provides other options to reduce the design costs of real prestressed bridge decks. GARCÍA-SEGURA, T.; YEPES, V.; ALCALÁ, J. (2016). Computer-Support Tool for Automatically Optimize Bridges. Abstract: In bridge design, many variables like material grades, cross-sectional dimensions, passive and pre-stressing steel need to be modeled to evaluate the structural performance. Efficiency gains are intended while satisfying the serviceability and ultimate limit states imposed by the structural code. In this paper, a computer-support tool is presented to analyze continuous post-tensioned concrete (PSC) box-girder road bridges, to minimize the cost, and to provide the optimum design variables. The program encompasses six modules to perform the optimization process, the finite-element analysis and the limit states verification. The methodology is defined and applied to a case study. A harmony search algorithm optimizes 32 variables that define a three-span PSC box-girder bridge located in a coastal region. However, the same procedure could be implemented to optimize any structure. This tool enables one to define the fixed parameters and the variables that are optimized by the heuristic algorithm. Moreover, the output provides useful rules to guide engineers in designing PSC box-girder road bridges. YEPES, V.; MARTÍ, J.V. ; GARCÍA-SEGURA, T. (2016). Design optimization of precast-prestressed concrete road bridges with steel fiber-reinforcement by a hybrid evolutionary algorithm. Abstract: In this paper, the influence of steel fiber-reinforcement when designing precast-prestressed concrete road bridges with a double U-shape cross-section is studied through heuristic optimization. A hybrid evolutionary algorithm (EA) combining a genetic algorithm (GA) with variable-depth neighborhood search (VDNS) is formulated to minimize the economic cost and CO2 emissions, while imposing constraints on all the relevant limit states. The case study proposed is a 30-m span-length with a deck width of 12 m. The problem involved 41 discrete design variables. The algorithm requires the initial calibration. Moreover, the heuristic is run nine times so as to obtain statistical information about the minimum, average and deviation of the results. The evolution of the objective function during the optimization procedure is highlighted. Findings show that heuristic optimization is a forthcoming option for the design of real-life prestressed structures. This paper provides useful knowledge that could offer a better understanding of the steel fiber-reinforcement in U-beam road bridges.